Clement of Alexandria (Stromata III.4) records a sentence that the Nicolaitans ascribe to Matthias: "we must combat our flesh, set no value upon it, and concede to it nothing that can flatter it, but rather increase the growth of our soul by faith and knowledge". 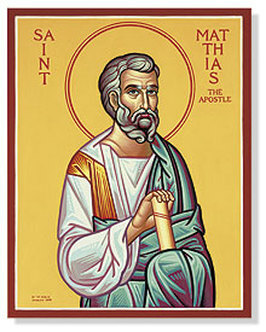 This teaching was probably found in the Gospel of Matthias which was mentioned by Origen (Hom. i in Lucam); by Eusebius (Church History III.25), who attributes it to heretics; by St. Jerome (Praef. in Matth. ), and in the Decree of Gelasius (VI, 8) which declares it apocryphal. It is at the end of the list of the Codex Barrocciamus (206). This Gospel is probably the document whence Clement of Alexandria quoted several passages, saying that they were borrowed from the traditions of Matthias, Paradoseis, the testimony of which he claimed to have been invoked by the heretics Valentinus, Marcion, and Basilides (Stromata VII.17). According to the Philosophoumena, VII, 20, Basilides quoted apocryphal discourses, which he attributed to Matthias. These three writings: the gospel, the Traditions, and the Apocryphal Discourses were identified by Zahn (Gesch. des N. T. Kanon, II, 751), but Harnack (Chron. der altchrist. Litteratur, 597) denies this identification. Tischendorf ("Acta apostolorum apocrypha", Leipzig, 1851) published after Thilo, 1846, "Acta Andreae et Matthiae in urbe anthropophagarum", which, according to Lipsius, belonged to the middle of the second century.